Product code: ES3761 Categories: Sold Items, Sold Rings. Rock crystal is a wonderful colourless crystal from the quartz family that was used during the Art Deco period of the 1920’s to the 1940’s and here is a wonderful Art Deco rock crystal and diamond ring that is sure to impress. Made in 18ct white gold, the white gold matches the rock crystal so well. In the centre is a magnificent piece of carved rock crystal that has the most amazing translucency to it combined with a radiating carving design. Set into the rock crystal is a 0.02 carat diamond that even has been set into a elegant design in its own right. The detail and workmanship on the side is so attractive and looks magnificent of the finger and really makes this ring stand out even more. The top part of the ring measures 12.3mm across by 13mm and sits so nice anf flat on the finger. 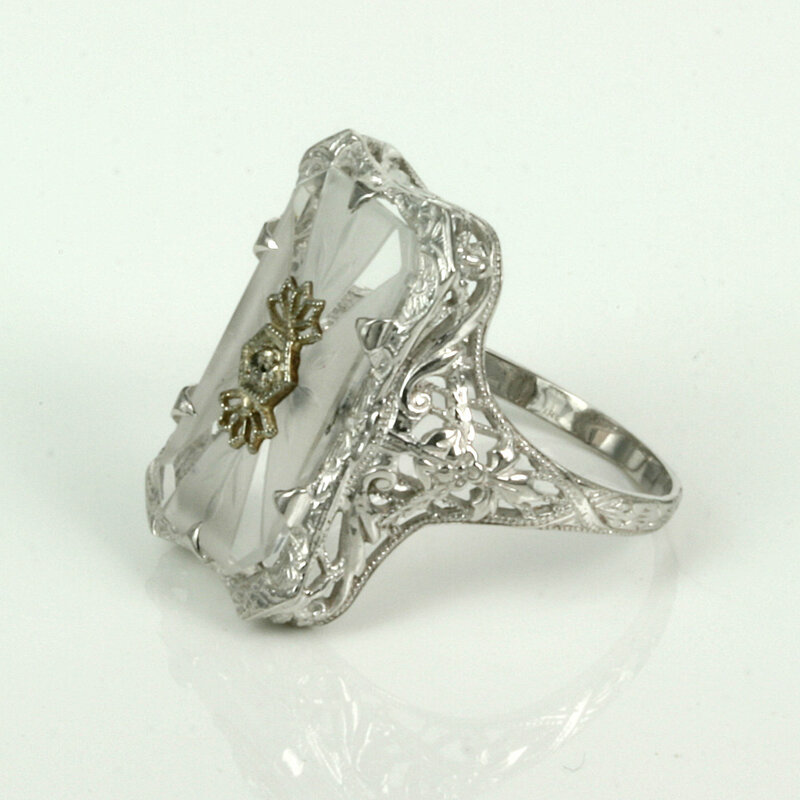 From every angle this is a stunning Art Deco ring that will look fabulous anytime of the day or night.